Lee Bradbury is hoping the Hawks can turn on the style with a first home win as they face Aldershot in the televised clash tonight. The match at Westleigh Park certainly promises to be exciting with both teams in need of points to get them firing in the National League. At home the Hawks have been really unfortunate not to have picked up at least one victory so far. BT Sport are showing the match live tonight and it would be a great time for the Hawks to get that first home success (7.45pm). Hawks boss Bradbury knows his team need to be switched on at all times. He said: ‘For me we have been putting in the performances without getting the rub of the green. ‘With the cameras at Westleigh Park hopefully we can pick up that elusive first home win. New forward Ibra Sekajja is certain to be involved at some stage of the match. 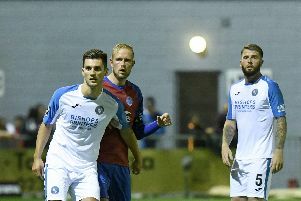 Bradbury is keen to have a good look at the former Bognor and Dulwich Hamlet player who made his debut as a substitute against Hartlepool on Saturday. The Hawks boss added: ‘Ibra is looking for a permanent deal. He is strong and can make things happen in and around the opposition area. The Hawks, who have been very unlucky not to get more wins so far, may have to cope without Jordan Rose who has a hamstring injury, while Mike Carter has an ankle problem. Bradbury said: ‘The players have been working their socks off for each other.